Float like a butterfly… and go fast! Okay, maybe that isn’t how that saying goes. But the meaning is pretty much the same. It is one that is exemplified with two new graphics for the hugely popular HJC FG-17. 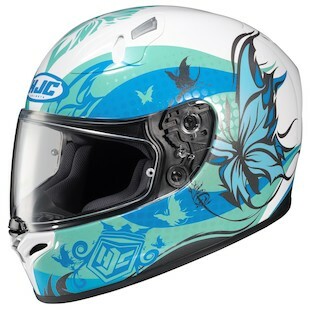 With the HJC FG-17 Flutura Helmet, the influence of the butterfly can not be missed. It is displayed in a way that would make even Mariah Carey proud (I’m not too proud to admit I listened to that back in the day … okay, maybe I am … never mind I said that). Coming in a variety of colors from Red, to Blue, and a White/Black option as well, there are ample choices as to how you might want to express your inner lightheartedness in this swooping and smooth graphic. Conversely, the new HJC FG-17 Thrust Helmet is jagged and blunt. No lighthearted fluttering here. Angular lines and sharp corners give this helmet the feeling of a lid that is about to hit warp speed and leave all stragglers in the dust… unapologetically. 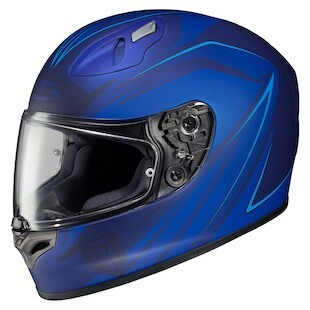 With options in Blue, Red, Black, and a Grey/Yellow/Orange/Red combination, these helmets definitely have a lot to offer a variety of riding styles. Whether you prefer soft and smooth or crisp and rugged force, the newest graphics out of the HJC line look to offer you an option that you can assert your presence in heartily.